Vertigo is a type of dizziness or faintness that makes you feel like you are spinning. You become lightheaded, and while you may feel as though you or the things around you are moving, in reality, they are not. Those with vertigo also have difficulty maintaining balance when standing or walking. This often results in falling—a major concern among the elderly. Homeopathy for vertigo provides an effective treatment option. Some of these homeopathic remedies include belladonna, china, and conium. Read on to learn about these remedies and many more that may help treat vertigo without any side effects. Vertigo is not a disease, but rather a symptom of an underlying problem. Vertigo is often brought on by changing the position of your head, but normal underlying causes that contribute to the condition also include a sudden drop in blood pressure, dehydration, high stress, head trauma, a viral infection, and an inner ear infection due to benign paroxysmal positional vertigo (BPPV). Meniere’s disease and vestibular neuritis, or labyrinthitis, are also types of vertigo that result from severe inner ear disorders. There is a lot of evidence to suggest that homeopathy for vertigo is the way to go. Several journal articles include studies with positive results when it comes to homeopathy for vertigo. In particular, many of these studies feature the homeopathic formula called Vertigoheel, which contains a popular remedy known as Cocculus indicus (Indian cockle). One study published in the Journal of Alternative and Complementary Medicine in 2005 found that Vertigoheel would improve atherosclerosis-related vertigo symptoms in 87 patients. A meta-analysis of 1,388 patients also found that Vertigoheel is effective against vertigo in comparison to anti-vertigo drugs like betahistine and dimenhydrinate, and the natural remedy Ginkgo biloba. That being said, the biggest form of evidence when it comes to homeopathy is clinical. This means a qualified homeopath will select a remedy for vertigo based on a person’s emotional, mental, and physical symptom picture. The following are 12 homeopathic remedies your homeopath may suggest for your vertigo symptoms. Belladonna is one of the top homeopathic remedies used for vertigo, especially when the problem worsens after changing your position. When this remedy is needed, the person may show the tendency to fall backwards or to the left side. Other symptoms will include an acute headache, excessive heat, and labored breathing. The person sometimes gets relief from applying pressure on the head. Belladonna is also useful for vertigo accompanied by stiffness and pain in the cervical back. China is a homeopathic remedy made from Peruvian bark. China is considered one of the better homeopathic remedies for Meniere’s disease. It is also used for a sensation of heat in the head and vertigo-related headaches. China is also used in vertigo patients after blood or fluid loss from diarrhea. Other symptoms include weakness, dizziness, and difficulty walking. It is interesting and inspiring to know that dangerous things found in nature, like poison hemlock, have the power to heal as well. Otherwise known as “Conium,” the herb is an effective treatment for vertigo when lying down or turning in bed. In addition, you get dizzy turning your head sideways—specifically to the left—and when moving your eyes. Your eyes, by the way, may excessively tear or sweat, and be sensitive to light. Symptoms worsen with slight noise or the conversation of others. It can be triggered by smoking cigarettes. All symptoms are worse from long bouts of sexual abstinence; unsatisfied sexual desire; and from motion, seeing moving objects, and drinking alcohol. They are better from sitting, being in the sun, closing the eyes, and applying pressure to your head. Conium is also very effective for BPPV and Meniere’s disease, especially when vertigo results upon turning the eyes or turning the head sideways. It is also an appropriate remedy for the elderly who experience vertigo and may be useful for those who turn their position while in bed. When it comes to homeopathy for vertigo and Meniere’s disease, gelsemium is often a remedy that comes to mind. It is one of the better homeopathic remedies for vertigo symptoms including dizziness, dim vision, heavy eyelids, and vertigo that begins in the back of the head before spreading. It is also useful for dizziness due to tinnitus, blurry vision, or double vision. Gelsemium is helpful for vertigo due to cervical problems as well. Heaviness of the head, especially around the eyes, is another particular symptom where gelsemium is required. There is also a loss of balance while walking, and this leads to staggering. Cocculus indicus is a commonly prescribed homeopathic remedy for vertigo, and as described above, it is the main ingredient in the homeopathic vertigo formula Veritgoheel. It is best used when one’s nausea and dizziness are exacerbated by riding in a moving car or train. It is the premier remedy for motion sickness caused by motion. Digestive troubles may accompany symptoms. You’ll know that Cocculus is for you if, looking out the car window, or out from a boat to the moving water, you suffer swift nausea. Simply, you can’t look at moving scenes. Cocculus is also a remedy of choice for vertigo associated with ear complaints. Vertigo may also be accompanied by nausea, vomiting, faintness, palpitations, weakness, and tremors. Symptoms may worsen from watching moving objects, drinking or eating, raising the head, or upon rising from sitting or while in bed. Bryonia alba is a very reliable homeopathic remedy for Meniere’s disease and vertigo symptoms. The person feels as if they are sinking into their bed, and as if everything is turning in a circle. It is also used for gastric vertigo where there is nausea. Vertigo may also result when you get out of bed in the morning, open your eyes, or change the position of your head. The person will also suffer from some form of tinnitus where they hear humming or roaring sounds. Other symptoms include headaches, confusion, dizziness, fainting, and falling forward or backward. Symptoms improve from walking, lying down, or sitting, but they worsen from warm rooms, raising your head, or even the slightest motion. For older adults, Phosphorus might be the ticket to relief from vertigo. It’s best for the kind that occurs after getting up in the morning from bed. The sensation you feel is a whirling one, a floating one. You have a strong craving for ice-cold drinks and food. You feel much better in the dark. Phosphorus is also quite effective for vertigo when there is fainting. Symptoms worsen from looking up or down, turning, violent motion, stooping while sitting, warm rooms, and exerting your eyes. That being said, symptoms improve from open air, lying down, and after a bowel movement. The all-healing remedy is best for vertigo that lessens considerably when you are out in the open, breathing in fresh air. “Pulsatilla” is primarily a remedy for women, because the vertigo is worse with suppressed or delayed menses. For men or women, the symptoms are worse upon looking upward. Aside from dizziness, you’ll have stomach and digestive problems and bouts of nausea. Pulsatilla is useful for vertigo with a sensation that feels like objects around you are moving in a circle. Pulsatilla is also used for vertigo ear issues, especially when there is a thick discharge from the ear. Chenopodium is a homeopathic remedy made from American wormseed—a plant native to Central and South America and the Caribbean. This remedy is used for vertigo and Meniere’s disease, especially when the person complains of sudden vertigo with tinnitus. As a result, the person will hear a lot of buzzing sounds while being unable to hear low-pitched sounds. Chenopodium is also used to treat right-sided migraines with giddiness, as well as right-sided paralysis. Silicea is one of the better homeopathic remedies for vertigo when it is caused by an ear infection. There is also an offensive pus-like discharge from the ear. A characteristic symptom when silicea is required is excessive perspiration on the head. Vertigo symptoms will improve by keeping the head wrapped in something warm like a hat or toque. Cyclamen is an excellent homeopathic remedy for vertigo with vision problems. It is used when the person feels spots of colors floating in front of the eyes. There may also be double vision, dimness of vision, and severe headaches. Objects may also feel like they are revolving in a circular motion. Symptoms worsen from open air; however, they improve while indoors. “Nux” is a good bet if you tend to suffer bouts of vertigo in crowded places, or places where lots of lights are bouncing around. This type of vertigo often leads to momentary loss of consciousness. It also feels as though the room is whirling. Overall, you feel intoxicated although you haven’t drunk anything. There is also often nausea and vomiting. Symptoms are worse in the morning, in open air, when smoking, and when drinking alcohol or coffee. Anger, overeating, stress, mental exertion, and looking up or down will also make things worse. Symptoms improve from lying down. There are also many other homeopathic remedies used to treat vertigo symptoms. For instance, borax is a remedy used in those who experience vertigo from tilting their head downward. Tabacum is an anti-vertigo remedy when there is nausea along with a cold, clammy feeling. Calcarea carbonica is also used for vertigo from walking, which induces nausea and vomiting, whereas lachesis is a remedy where vertigo produces a rush of blood to the head. Homeopathy for vertigo doesn’t end there. Other homeopathic remedies used for vertigo include euphrasia, Chininum sulphuricum, petroleum, Magnesium phosphoricum, iodine, Ferrum metallicum, Rhus toxicodendron, aesculus, aconite, Argentum metallicum, Apis mellifica, Calcarea sulphuricum, Cannabis indica, digitalis, dulcamara, Natrum muriaticum, sulphur, Secale cornutum, sabina, thuja, Kalium iodatum, Natrum carbonicum, graphites, and salicylic acid. Homeopathy for vertigo is a great approach to treat the condition naturally. 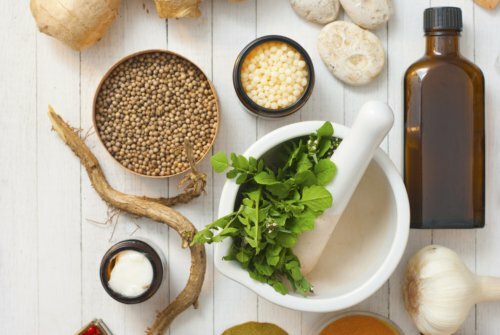 Some of the homeopathic remedies your homeopath may recommend that are mentioned in this article include belladonna, china, conium, gelsemium, Cocculus indicus, Bryonia alba, phosphorus, pulsatilla, chenopodium, silicea, cyclamen, and Nux vomica. How do you take homeopathic remedies? In general, take five liquid drops or one pellet every 15 minutes for intense symptoms and every four hours for milder symptoms. Once symptoms have improved, you should stop using the remedy until symptoms return. If after three doses there is no improvement, this is when your homeopath should be consulted. It is a good idea to work with a qualified homeopath to help determine what remedy is best for you. They will also be able to select the right frequency, dosage, and potency for your vertigo symptoms. And as with any natural remedy, consult with your doctor who will advise you of any potential allergic reactions or drug interactions to look out for. Balch, J., et al., Prescription for Natural Cures: A Self-Care Guide for Treating Health Problems with Natural Remedies Including Diet, Nutrition, Supplements, and Other Holistic Methods (Hoboken: John Wiley & Sons, Inc., 2004), 544-547. Issing, W., et al., “The homeopathic preparation Vertigoheel versus Ginkgo biloba in the treatment of vertigo in an elderly population: a double-blinded, randomized, controlled clinical trial,” Journal of Alternative and Complementary Medicine, Feb. 2005; 11(1): 155-160, doi: 10.1089/act.2005.11.155. Schneider, B., et al., “Treatment of vertigo with a homeopathic complex remedy compared with usual treatments: a meta-analysis of clinical trials,” Arzneimittel-Forschung, 2005; 55(1): 23-29, doi: 10.1055/s-0031-1296821. Lockie, A., Encyclopedia of Homeopathy: The Definitive Home Reference Guide to Homeopathic Remedies and Treatments for Common Ailments (New York: DK Publishing, Inc., 2000), 135.